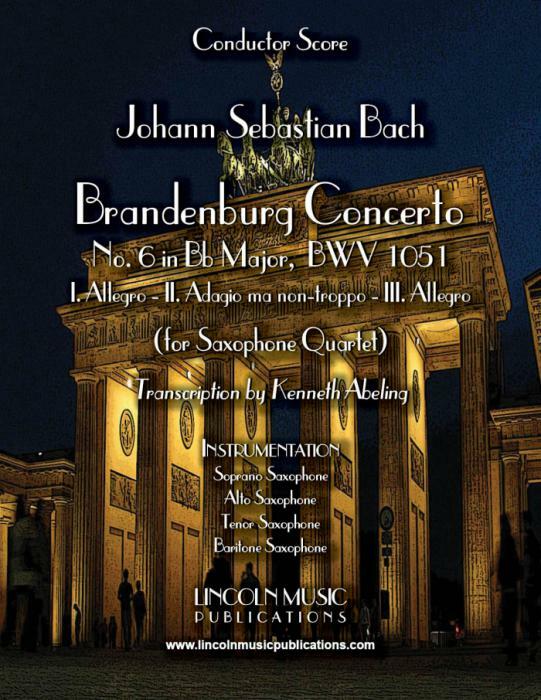 This is the complete Brandenburg Concerto No. 6 Johann Sebastian Bach transcribed for Saxophone Quartet by Kenneth Abeling. It has an optional organ part if so desired, but will work perfectly well without. Originally written for two viola da braccio, two viola da gamba, cello, bass violin and continuo, this transcription despite its difficulty may actually be accessible to more advanced non-professional quartets. It for the most part lays well on all of the instrument and once continuous lines have been dispersed to allow for some breaks. Playing Time 16:00.